Globalization has transformed China into the “world’s factory.” Eighteen years ago, developed and newly industrialized countries moved their labor-intensive and low-tech industries into the country. However, the onset of the Sino-U.S. trade war prompted a growing number of foreign companies to leave China and move to Southeast Asia, giving Australia new opportunities. China, the “world’s factory,” is losing its competitive edge. Foreign businesses have started to leave China years ago because of soaring costs, but the Sino-U.S. trade war just greatly accelerated this process. China’s average direct production cost in 2004 was 6 percent lower than Mexico’s, but by 2014, Mexico’s production cost was 4 percent lower than China’s, according to a report by the Boston Consulting Group (BCG), an American multinational management consulting firm. The current average manufacturing cost in China is only about 5 percent lower than in the United States, according to BCG. These dynamic changes in the relative costs of manufacturing have prompted multinational companies to reassess their manufacturing locations, leading to a huge shift in global supply chains. According to a BCG report in 2014, India, Indonesia, the Netherlands and the United Kingdom rose to prominence in the global manufacturing industry and were referred to as “regional rising stars.” China was not as competitive as it used to be. Mexico had regained its low-cost manufacturing advantage and could produce goods for U.S consumers. Even the United States was competitive at that time. John Calverley, head of global research at Standard Chartered, pointed out that according to a survey by South China Manufacturing Center in 2015, 11 percent of factories in southern China planned to move to ASEAN countries, India and Bangladesh to avoid increasing costs. Foreign companies can use industrial automation as a strategy to offset high labor costs. However, low-tech and labor-intensive industries, such as the clothing industry, rely heavily on skilled labor, which cannot be automated. An alternative strategy in reducing labor costs is to move manufacturing from China’s coastal areas into the mainland. But this would only work in the short-term. The increase in wages and the tariffs imposed by Washington (amid the Sino-U.S. trade war) do not offset the costs of relocating into the mainland–they only add to the costs of operating in China. The only other option for a foreign company is to leave China. Low-tech and labor intensive industries are not complicated to set-up and its workers are easy to train, making it feasible for a foreign company to move production to another country. These factors have pushed a large number of foreign enterprises to move out of China at an accelerating rate. 60 percent of Japanese companies operating in China have been transferred or in the process of transferring out of China to other countries, while the remaining 40 percent are planning how to withdraw their funds, according to a recent report by Kyodo News, a Japanese news agency based in Tokyo. According to the American Chamber of Commerce in China, a nonprofit organization with membership of more than 3,300 individuals from 900 companies operating across China, 35 percent of the companies it surveyed have moved or considered moving their production bases out of China to other countries such as Southeast Asia. Taiwan factories in China that manufacture shoes for Nike, Adidas, Under Armour and other brands have moved their production lines to Southeast Asia and India, according to a Sept.16 report by Japanese financial newspaper Nihon Keizai Shimbun. To avoid the high tariffs imposed by the United States, Chinese manufacturing companies are also moving out of China–their products range from bicycles, tires, plastics to textiles. Many Chinese factories are transferring their assembly lines abroad. Kerry Logistics Network Ltd, Asia’s largest shipping and logistics company based in Hong Kong, is currently moving its production lines from China to Malaysia, Vietnam, Myanmar and even Laos. 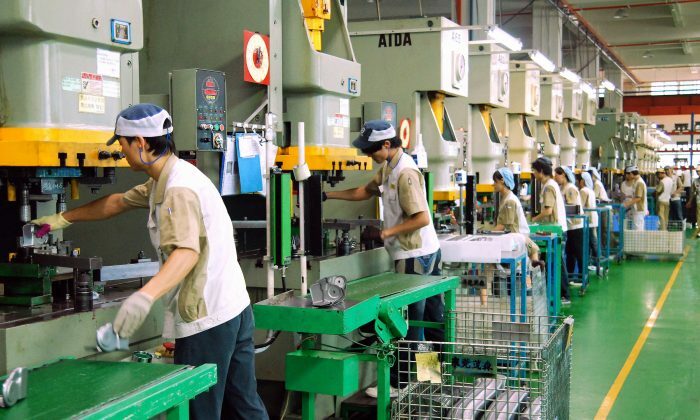 An increasing number of manufacturing companies have been setting up their production lines in Indonesia (one of the four new stars in the global manufacturing industry) the Philippines and Malaysia. These three Southeast Asian countries have two things in common. First, they are close to Australia. Second, their industrial systems are incomplete. They will rely on Australia to complete their industrial systems with supplies such as various materials, manufacturing equipment, and regional design centers. As a result, the “world’s factory” will move southward from China and form a new “Asian World’s Factory.” Australia, with its geographic advantage, has the opportunity to become part of it. Dr. Cheng Xiaonong is a scholar of China’s politics and economy based in New Jersey. He is a graduate of Renmin University, where he obtained his Masters degree in economics, and Princeton University, where he obtained his doctorate in sociology. In China, Cheng was a policy researcher and aide to the former Party leader Zhao Ziyang, when Zhao was premier. Cheng has been a visiting scholar at the University of Gottingen and Princeton, and he served as chief editor of the journal Modern China Studies. His commentary and columns regularly appear in overseas Chinese media.